What is Incogna Image Search and what makes it different? I found the image I like, now I want to see the full size picture? I clicked on an image and did not find anything that I like. Can I go back to the original categories I saw and pick out another image? Can I search by uploading an image? I have found inappropriate material (pornographic, offensive, etc.) in the results, will you remove it? You have indexed my content and I wish you hadn't. I submitted a query but the search didn't find acceptable results. How many furlongs to a parsec? Incogna is a new type of image search engine that improves both the quality of image search results and the overall user experience. 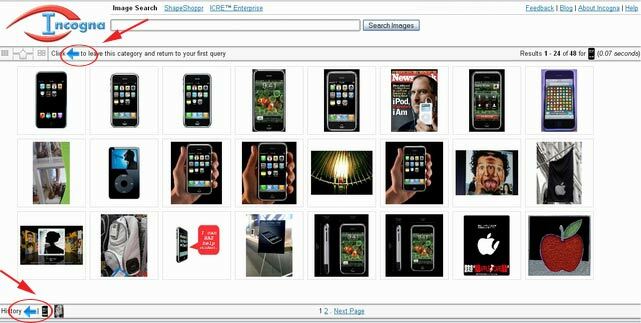 Most of the common image search engines today only do a 'meta-tag search' - they only look at the labels for each image. 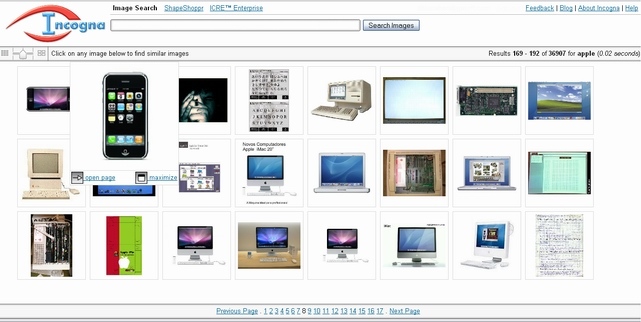 Instead, Incogna helps user find images that have a visual similarity with any given image. This lets you filter out the results you don't want and get to what you do want by reducing the unrelated images that constantly clog up the results in other image search engines. On the results page, find the image that you like most and click on this image - now you've got similar images! 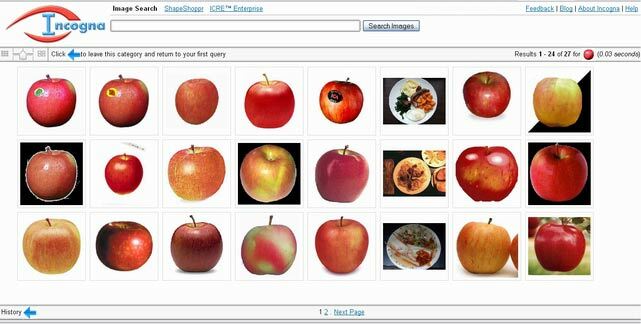 For instance, if you enter the query "apple", your results include many visually distinct categories from which to chose: you get fruits, products from Apple Inc., apple trees, etc. 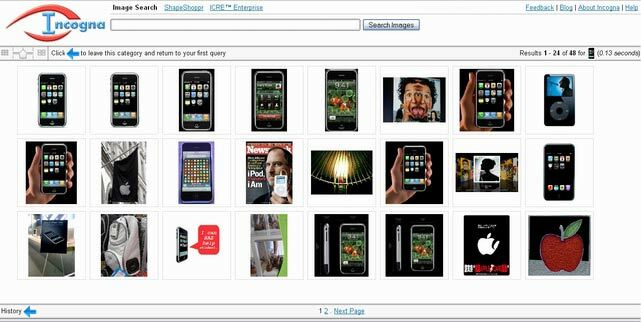 Our engine lets you refine your search; if you want pictures of Apple's iPhone, click on the image you like and Incogna returns images similar what you chose! 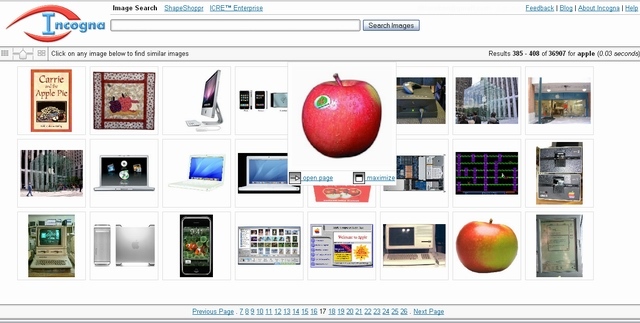 Alternatively, If you meant to do more of a fruit-based search, click on the picture of the fruit and again, Incogna will return similar images. Move the mouse over the image you want, it will zoom in and icons will display below the image. You can go directly the image's main website by following the link "open page"; if you only interest in the image, using the "maximize" link and you will see the full size picture without leaving Incogna's website. Please take care to respect the owner's copyright on their work! Note: The full size picture might not be available if the original website has been taken down or if the website does not allow remote linking. If it does not load, try clicking on the page link. Find the "History" bar on the bottom left corner of the screen, click on the icon. Once you're back at the category listing, the "Click on any image below to find similar images" message displays on the banner. Now, you can try another image! We're a startup so we've got limited resources and we're busy expanding the index as fast as possible, for the benefit of all users. We have support for image-based query and we'll make it available to you as soon as we can! We've done our best to tune the visual algorithms to filter out pornographic and generally offensive content, but if you found something we missed, please send the link to us and we'll have it removed. We collect personal information when it is voluntarily provided to us during registration for one of our services. When you use our services, we automatically record pieces of information such as the URL you visit, your IP address, the date of your request and which browser you're using. All such personal information collected during the use of our services (not including signup information) is deleted after six (6) months of its collection. If you wish, your account information can be completely removed from our database, upon request. Our webcrawler (incognabot if you wish to reference it) respects the robots.txt file, but if we have already indexed something that you wish to be removed, please tell us. Incogna is adding new images from all over the Internet every day. However, the current index is still relatively small comparing to the vast billions upon billions of images available online. Check again soon and we'll certainly have more of what you're looking for! As well, we'll be adding functionality that lets users submit images directly into our engine soon, giving you control over your content and how we search it. 1.5 x 10^14. For all other questions, contact us. Have a suggestion? A bug? Please, let us know!